The Menu Express printed Flyers. *All Flyers on 80lb gloss. 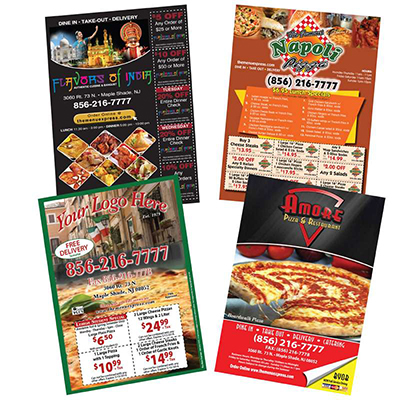 The Menu Express Prints high quality, eye-catching flyers for any business or occasion. Flyers are a standard part of everyday marketing, whether it is to announce a grand opening for your new business or promote your existing business with specials, coupons or discounts. No matter what your promotion is, full-color flyers are a cost-effective method of getting your word out. Call us toll Free at 877-250-2819, To have your Flyers printed and mailed to your target audience. To request your quote for Flyers, simply complete this form!